Foot Problems: Why Are My Toenails That Color? Whether you're washing your hands or admiring a manicure, you spend a lot more time looking at your fingernails than your toenails. Maybe it's time to focus on your feet more often (and not just during sandal season). 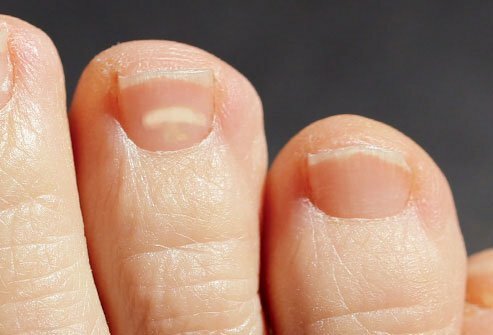 Toenail color changes -- from a big blue spot to a thin brown line -- could signal health problems. Here's what you need to know. 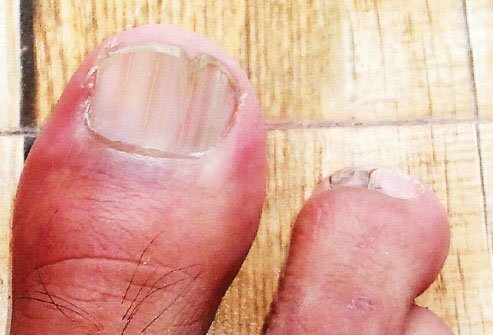 If your toenail turns black, it's most likely a bruise under the nail, technically called a subungual hematoma. You can get it from stubbing a toe or from footwear that cram your feet into the front of the shoe. 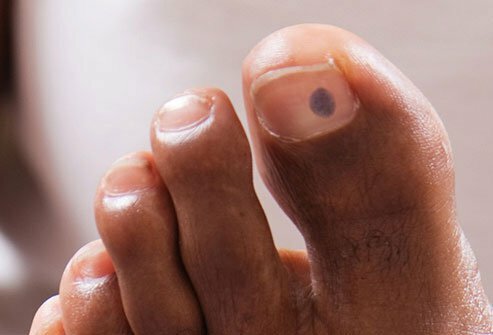 The bruise usually starts out red, then becomes purple, dark brown, and finally black when blood beneath the nail pools and clots.Expect your black toenail to grow out in about 6 to 9 months or longer. 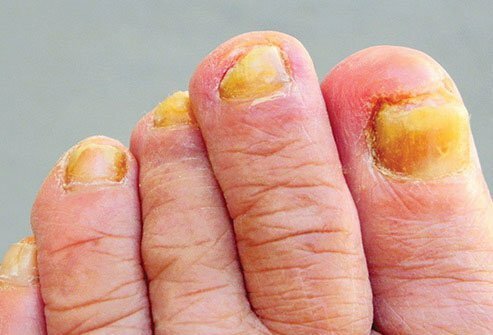 When toenails turn yellow, a fungus is usually to blame. This type of fungal infection is so common that you might not even need to see a doctor for treatment. Try an over-the-counter antifungal cream. If your nail is yellow and thick, gently file down the surface so that the drug can reach deeper layers. If at-home treatment doesn't work, a doctor visit is in order. 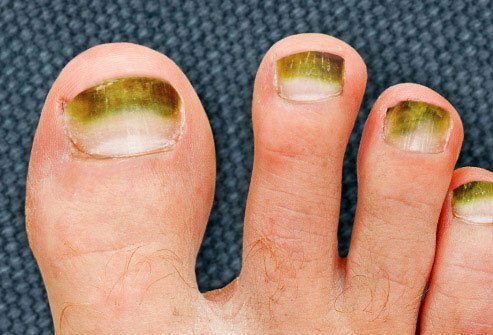 Unless you're wearing green nail polish, this is a color you don't want to see on your toenails. It could be green-nail syndrome (chloronychia), which is caused by an infection. The culprit is usually bacteria that thrive in damp or wet conditions. Think hot tubs, sponges, even tight-fitting shoes that you've worn for a long time. The color is underneath the nail, so don't try to scrub it off. Visit your doctor instead. If you stub your toe and it turns blue, you might not think twice about the color. But if you get a blue spot or a blue toenail for no clear reason, play it safe and see a doctor. You may have a blue mole beneath the nail. It's probably harmless. But in very rare cases, a type of blue mole called a cellular blue nevus can become cancer. Stubbing your toe doesn't always lead to a bruise. That's because the blood vessels under the nail might not break and leak blood. Instead, you might get a white spot on your toenail. It won't disappear like a bruise, but it will grow out in time. Toe trauma can also cause a white streak -- though you might not know you hurt yourself. For example, it can happen when sneakers are too small and your toe hits the front of the shoe. Do you have a toenail that's turned white, or has large powder-like patches? You could have a fungal infection, most likely one called white superficial onychomycosis. If possible, see a doctor as soon as you notice it. 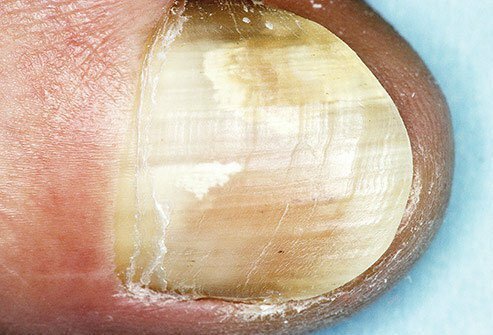 This infection spreads across the toenail. 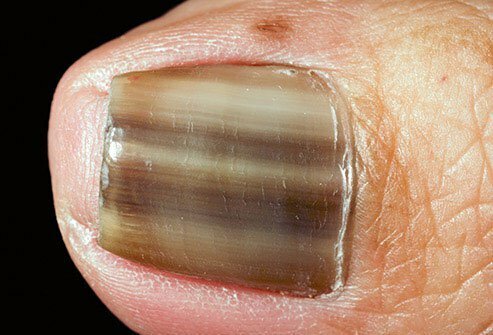 White superficial onychomycosis can cause the entire nail to become rough and crumbly. Another type of fungal infection is called proximal subungual onychomycosis. It looks like a whitish or yellowish patch that starts at the base of the toenail, near the cuticle. The infection is rare in healthy people. More often, it happens in people with weakened immune systems. It can also be a sign of HIV. 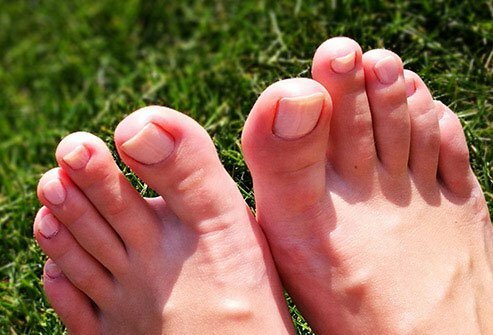 When toenails have red and white stripes, there are usually problems elsewhere on your body. These lines and V-shaped nicks are a hallmark of Darier disease. It's an inherited disease, mostly affecting the skin and causing greasy, warty, foul-smelling blemishes. Because there's a small chance your brown toenail streak could be a sign of something serious, play it safe and get checked out. THIS TOOL DOES NOT PROVIDE MEDICAL ADVICE. It is intended for general informational purposes only and does not address individual circumstances. It is not a substitute for professional medical advice, diagnosis or treatment and should not be relied on to make decisions about your health. Never ignore professional medical advice in seeking treatment because of something you have read on the eMedicineHealth Site. If you think you may have a medical emergency, immediately call your doctor or dial 911.